Hello and happy Tuesday!! 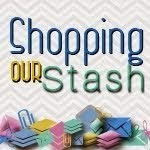 Are you ready for another Shopping Our Stash challenge?? The theme for this week's challenge is "Use Something New." Visit the SHOPPING OUR STASH BLOG for all the details on this challenge. I don't know about you, but I got some really cool crafty stuff for Christmas including an awesome set of duct tape rolls and sheets from my in laws (ya they rock). For this challenge I thought to myself..."how hard would it be to make an entire card from duct tape??" Turns out duct tape is super fun to work with!!! For this card I started with a Basic Black (SU) cardstock base and everything else is duct tape. The first layer is cut from a sheet of white duct tape. The next layer I used the smaller rolls of green and chevron duct tape on a scrap piece of white cardstock, the centre piece and edges were cut from a sheet of black duct tape. The pink skull I cut with my cuttlebug using the pink roll of duct tape on another scrap of cardstock. Thanks for visiting my blog this week, please check out the blogs of my SOS teammies (they're all listed on the right hand side of my blog) and show them some crafty love. Awesome use of the duct tape, Great card, I think I need to challenge myself to use my 20 rolls of washi and elmer's tape. A card made from duct tape? Shut the front door! That is absolutely genius, Donna! Love it! First off... how does one find such great in-laws? ;) Great gift, and such an amazing use of all that duct tape! Wow, you really DID score in the duct tape arena! I caved and got one sheet. Let's see if I ever use it. HA! Whoa! I've never thought to create with duct tape, but I like it! The pink skull looks great with that colorful background! Your card is so creative and cool! What a fresh and fun idea! yep, your in-laws win the prize!! I'm loving the neon! Wow...I have seen the duct tape all over, but never ever thought to use it on a card...how cool and creative is that!!! Very cute card!! Amazing! Duct tape has gone to a whole new level!